With fall coming fast, many are planning on taking advantage of the cool temperatures by hopping in their RV and hitting the road. Roughly 40 percent of them will be carrying at least one firearm in their RV, either for recreation or for security. After all, you never know what might happen. Whether you live in your RV full time or just use it for vacations, wanting to take a firearm with you is very common. Many people, however, aren’t confident in their knowledge of the gun laws pertaining to RV travel, especially across state lines. This can prevent them from carrying firearms with them, denying them protection, recreation, or both. After all, who wants to risk thousands of dollars in fines, 10 years in prison, and a felony record that prevents you from carrying – and voting – in the future? Not the ideal way to spend the next decade. Fortunately, traveling with a firearm in your RV doesn’t have to be complicated or confusing. If you want to carry a firearm with you in your RV, but aren’t sure about the laws, then this guide is for you. 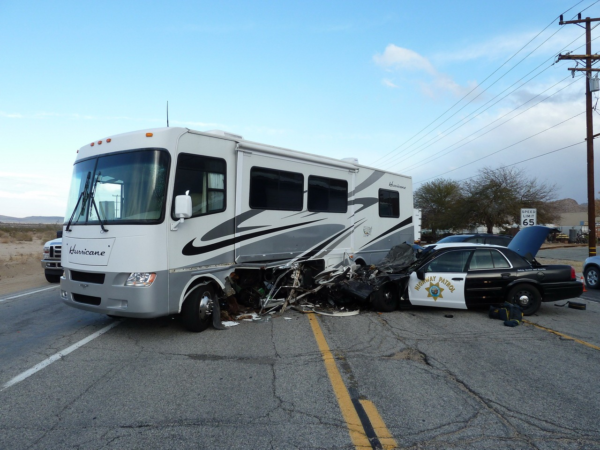 If you already carry in your RV, then this guide is a great way to brush up on the laws, and has some helpful tips for safe and practical carry in your RV. The federal law that you need to be aware of any time you cross state lines with a firearm is the Gun Control Act of 1968 (also known as the GCA or GCA68). 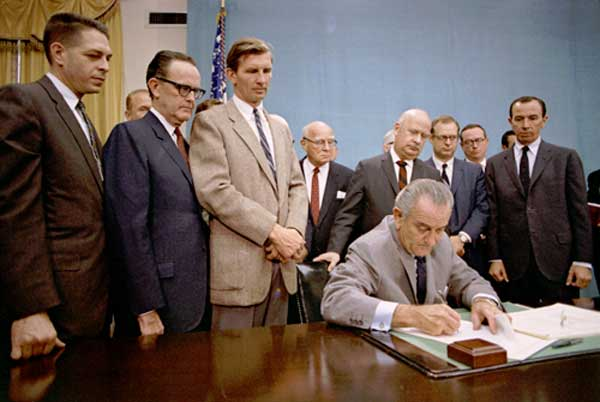 LBJ took a break from being American history’s weirdest president to sign the Gun Control Act of 1968.
persons subject to domestic violence restraining orders. In most situations, people who fall into any one of these categories are generally not permitted to own firearms anyway, so if you legally own the gun you wish to take with you, you’re probably fine. 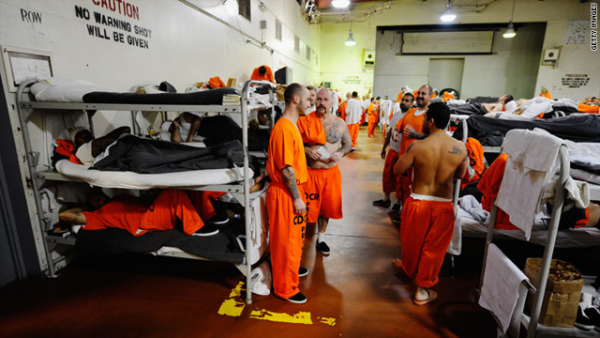 That said, if you fall into one of the above groups, but have had the conviction expunged or set aside, or have been pardoned and had civil rights restored, you can still carry across state lines. Juveniles are also generally excluded, except when traveling for purposes of employment, target practice, and education. The GCA also says that you don’t need a permit to to move a firearm across state lines in a vehicle. And yes, your RV is legally considered a vehicle, not a residence, even if it’s parked, and even if you live in it full time. However, the firearm is required to be unloaded and in a locked container, not the center console or glove compartment. Both the firearm and key to the locked container need to be out of easy reach of the driver and any passengers. 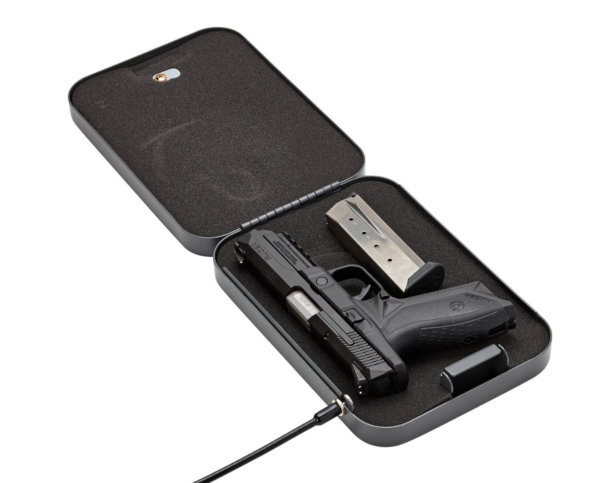 Check out our gun safe recommendations for some great storage options. Something simple like this SnapSafe Keyed Lock Box ($19) is plenty to keep you legal. Now these storage rules are just for crossing state lines. Within the state, you just have to follow the state’s laws for gun storage in a vehicle. It’s generally a good idea to find out the laws of each of these states well ahead of travel. Our guides to state gun laws are a great resource for this. 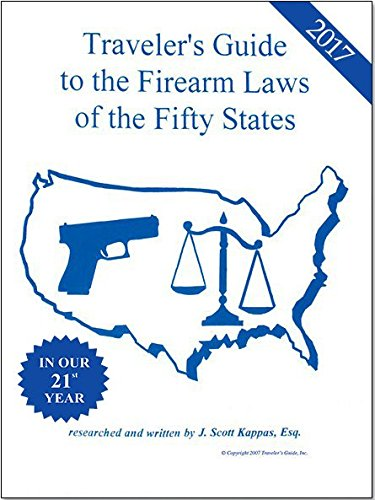 However, you may also want to keep a guide like the Traveler’s Guide for the Firearm Laws of the Fifty States ($18) in your RV in case of unexpected detours and spur of the moment side trips. Plus it doesn’t require an internet connection. On top of just knowing and following the law, getting a CCW permit with reciprocity that keeps you covered in as many states as possible is one of the best ways to ensure that you are able to comply with legal requirements. Most states don’t require you to be a resident to get a permit, or otherwise offer non-resident permits, and many allow mail in or electronic application. That means you don’t necessarily have to even step foot in the issuing state to get your permit. Idaho and Texas’s standard non-resident permits are each recognized by 32 of the 50 states, but not the same 32. 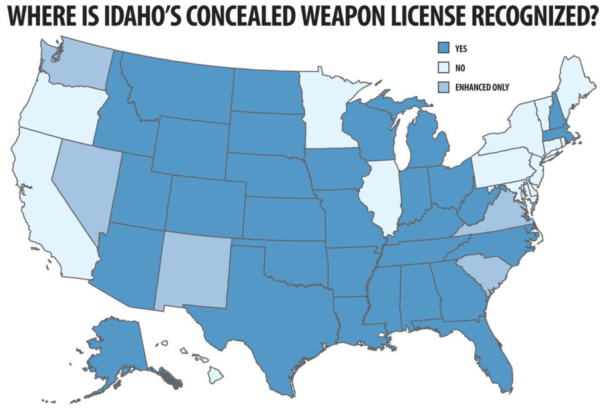 The only concealed carry permit with greater reciprocity than these is Idaho’s Enhanced Concealed Weapons License, which is recognized by 35 states. Which concealed carry permit is best for you depends on more than just the number of states you’re covered in though. You want to pick the one that covers you in the most states you’ll actually be visiting. For example, it’s not particularly useful to get an Idaho E-CWL and get covered for three extra states if you really want to take your RV to visit your family in Pennsylvania, where it’s not recognized. On top of that, you’ll also want to consider the cost of fees, how long the permit is good for, and whether you have to apply within the state. Our concealed carry laws guides and USA Carry’s concealed carry resources are both great sources for this kind of information. Some states allow you to be exempt from their gun laws if you are just traveling through the state. By traveling through, states generally mean that you’re only stopping for gas and emergencies, with no sightseeing or overnight stops. However, you generally must be compliant with the laws of both the state you crossed the border from and the state you are crossing the border into. It’s handy to know if any of these states are in your desired path, because it means you can go through states with stricter gun laws that you might otherwise have to drive around, like New York, saving you some serious travel time. When passing through these states you’ll want to keep things like campground reservations and recent receipts handy so you can provide evidence that you’re just passing through should you encounter law enforcement. In addition to state and federal laws, some counties and municipalities have laws governing firearms. This is more common for urban centers than rural areas, but you should still always check local laws to ensure that you can comply with them. It’s also important to remember that state and federal parks, forests, etc. generally have additional laws on top of the regular state and federal laws. And yes, they are laws. Unlike private campgrounds, the rules on government land are legally enforceable and can lead to fines or even jail time. Speaking of private campgrounds, you should respect their rules, too. Sure, they aren’t legally binding and it’s not like your RV is searched upon checking in, but you can end up kicked out without a refund or even facing trespassing charges if your unauthorized firearm is discovered. Be polite and respect the other rules, too. If you’re having trouble finding somewhere to stay overnight that allows firearms, try to find a business that allows boondocking. If you’re not in the know, boondocking is a free way to camp used by many RVers and road trippers. 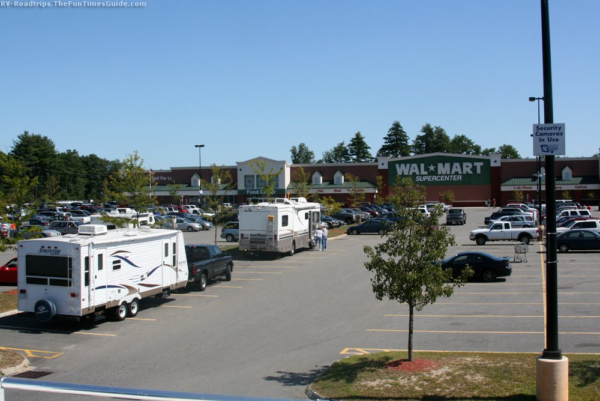 Many large businesses allow, or even encourage, RVers to park overnight. It’s generally a good practice to call ahead or go inside and ask permission first, but not necessarily a requirement. Some counties or municipalities don’t allow boondocking, so check local laws before settling in for the night. Common businesses that welcome boondocking include Bass Pro, Cabela’s, Flying J Truck Stops, Home Depot, Lowe’s, and Walmart. Conveniently, all of these also permit carry in store. 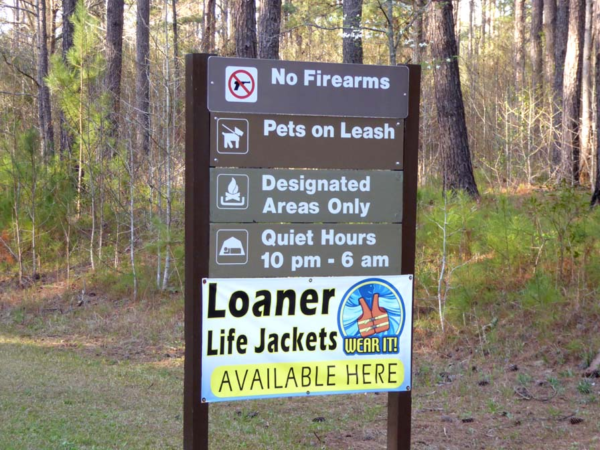 Fraternal lodges are also usually willing to allow you to park overnight and are very gun friendly, but they don’t have the convenience of other businesses. Walmart is the go to example of where you can boondock. Now that we’ve gone over what you have to know when RVing with your firearm, let’s talk about some useful tips. Whether you end up going through a traffic stop, get pulled over for a tail light you didn’t know was out, or have a knock on your door at 3 am to make sure you’re allowed to be in that lodge parking lot, you’re bound to encounter law enforcement eventually. Typically this won’t be a big deal. You’ll have a short conversation with the officer, then you can both move on with your lives. However, traveling with a gun can make this interaction a bit trickier in a couple of ways. 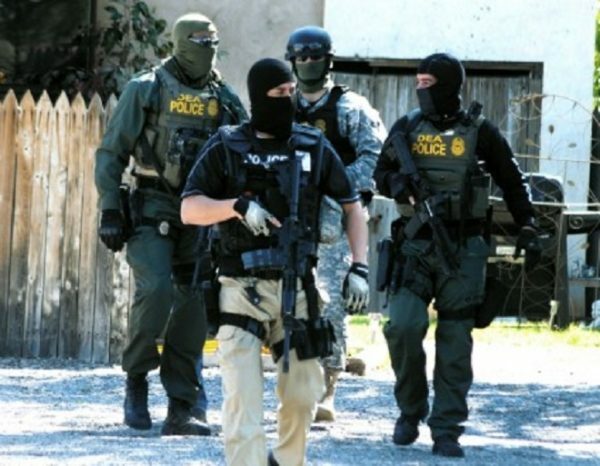 First, you may need to move your gun or access the area where it’s stored for some reason during the interaction, such as to produce documentation stored in your safe for the officer. In this case, clearly tell the officer that you have a firearm, where it is, and exactly how you’ll have to move it to get what you need, all before you move. Keep your hands clearly visible at all times. 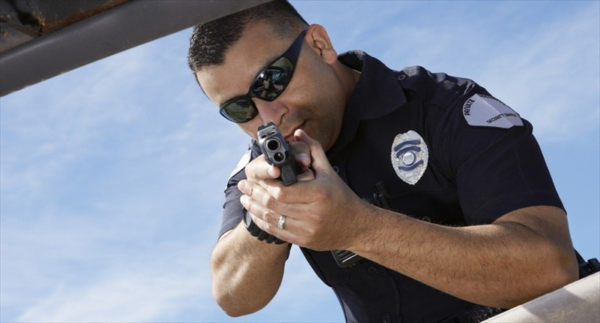 Basically, you never want to surprise a police officer with your firearm. You don’t want to be in this position because you forgot to tell an officer that you had a gun in your glove box underneath your insurance card. Second, a police officer may ask to enter your RV, either to search or to just take shelter while you chat. If this occurs, you can politely, but firmly tell the officer that unless they have a warrant, they may not enter your vehicle. Remember, this is your constitutional right. The only times an officer can legally search your RV without a warrant are if they have probable cause to believe a crime has been or is being committed inside, there is reason to believe someone will be harmed if the search is not performed, or they make an arrest while legally inside and are looking for items related to the crime for which they are arresting someone. You may not be doing anything illegal, or have anything illegal in your RV, but it’s far better to be cautious than to have the officer discover that you accidentally left your gun safe unlocked just this once or misunderstood a local firearms law, and face serious criminal charges. You should probably try to avoid this situation, too. It’s also generally a good idea to keep extra copies of your permits and a list of makes, models, and serial numbers for any firearm you have with you. That way if your permits or firearms are lost or stolen you have evidence of your permits and are able to give authorities a list of exactly what firearms are gone. 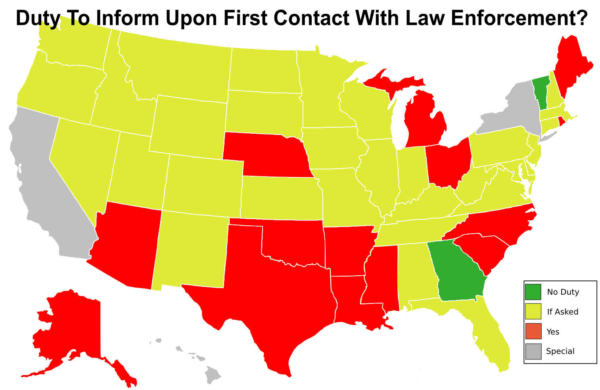 Some states also require you to inform any police officer that you are interacting with if you have a gun on your person, even if they wouldn’t otherwise know. Some states don’t consider in a locked container well out of your reach to be “on your person.“ Again, it’s important to know the state’s laws beforehand. This map can give you a general idea of what’s required, but always check state laws to confirm. Remember, a gun is not a guarantee of security. Don’t use it as an excuse to be reckless, and be sure to take additional steps to keep yourself. Your gun should be your last line of security, not your first or only defense. Don’t stay in areas that seem dangerous. Try to spend the night in campgrounds with locked gates or places with security patrols. Always keep your RV locked. Don’t let strangers into your RV. Don’t leave your RV at night unless you have to. Keep your cell phone on and charged at all times. You should also always travel with a companion, or at least a large and scary looking dog (it’s okay if your rescue is a giant teddy bear, he just needs to seem intimidating). No one needs to know that Simon is afraid of thunder and Garfunkel lets the cat bully him. 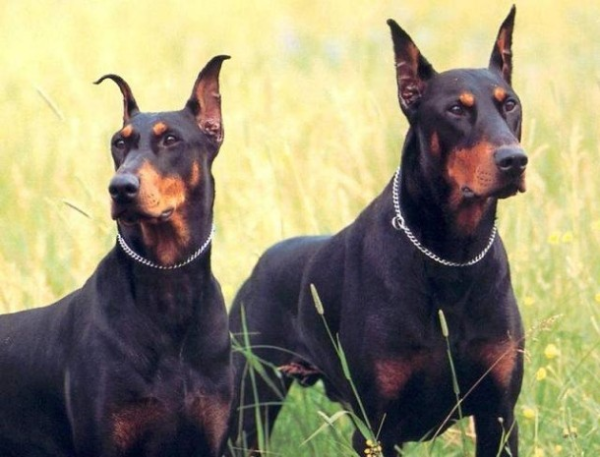 Even a recording of a man’s voice or barking dog is better than nothing. Women in particular may want to leave hints that they are travelling with a man, like a pair of men’s boots at the door or men’s clothes on the clothesline, even if they are traveling alone or in a group of just ladies. And of course, practice the same gun safety rules in your RV as you would anywhere else. Vacation is not an excuse to slack off on responsible gun ownership. If you want to take a gun with you for defense, not for a particular recreational event, you have a lot of options from which to choose. An easily-concealed handgun is typically far more practical than a long gun in the small space of an RV, both for storage and for maneuvering while armed. However, handguns can also be subject to stricter regulation in some places. If this is the case in many of the places you travel, it might still be easier to just tolerate the extra space needed and take a long gun, especially if you have a larger RV. Awesome, but not a practical solution for most of us. Some people choose to carry both a long gun and a handgun. This is especially common for those who have one type of gun for competition or recreation, and want the other for self defense. In this case, it is wise to consider taking guns that use the same type of ammunition (and ideally one that is widely available) so you don’t have to store ammunition for both types of guns, and you know that any ammunition you grab while trying to quickly load your gun will work. You should also take into account the legality of any firearms you want to travel with. For example, some states don’t allow “assault rifles” and what exactly qualifies varies from state to state. Know what is and isn’t allowed in areas you want to travel through, and choose guns that meet those requirements. Finally, there are a number of awesome services out there that allow you to rent an RV for the weekend (or the week) which is awesome for those of us without the space in our yard, or our budget, for an RV. Just be sure that the company or individual you’re renting from allows firearms in their vehicles…don’t want to run afoul of any of their rules and be politely asked to not come back. We like to recommend our friends over at Outdoorsy for stuff like this, because they’re super on board with any legal firearm-related shenanigans like hunting trips, or just taking a long weekend road trip somewhere . 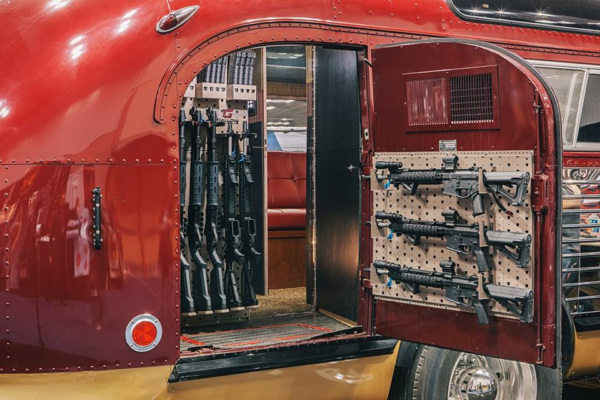 Do you tote a gun (or a few) with you when you go RVing? What do you take? Have any tips for navigating the laws or staying safe? Do you still have questions about best practices for RVing with a firearm? Tell me in the comments. Megan Kriss is an avid recreational shooter by day, and writer/editor by night. She has an extensive linguistics and writing background, and has written for everyone from Allstate to celebrity plastic surgeons. She also has experience in international affairs and political policy analysis. Thank you for this very informative article! I’m thinking of RVing full time at least for a while and have the goal of visiting all 48 contiguous states and eventually Alaska and Canada. I know my right to transport doesn’t carry through Canada, but this eases my mind about the 48! Glad we could help out! You can actually transport through Canada if you are heading to Alaska. It is just a declaration form you have to fill out and pay a fee ($25 last I checked). They have their own rules for what is prohibited and restricted though. You can bring restricted firearms through Canada but it requires multiple forms. What do you do with your firearms when you intend to visit a place where firearms are not allowed? The “Duty to Inform” map is not accurate.